SAC is stands for” Space Application Centre”. 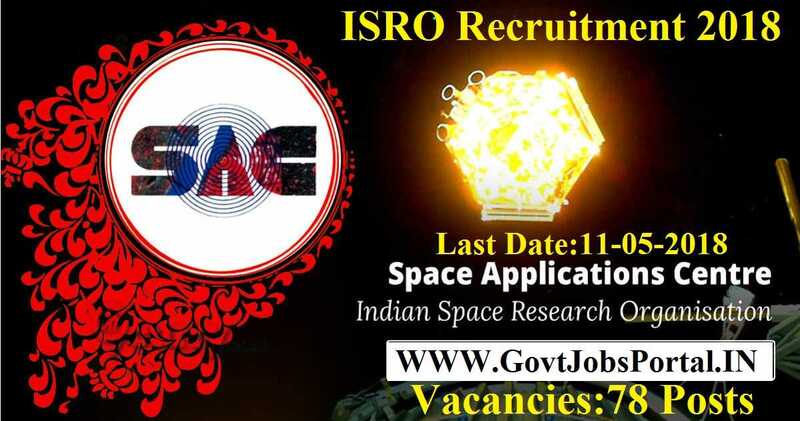 ISRO Recruitment department issued an official notification in which they said that they want to heir fresher Indian candidates for various technicians’ posts under SAC. SAC is inviting an online application form to be filled up from all eligible candidates of India. So those who are looking for Government jobs in India as a Technician can apply for this ISRO Recruitment 2018. Before applying to this SAC Recruitment, read the complete eligibility criteria below along with the various process related to this Government job under ISRO department. Number of Vacancies: 78 Posts. What are the Eligibility Criteria Required for this SAC Recruitment 2018? Those who have passed in their 10th class examination. (SSC/SSLC/10th class) and must have 2 year certificate in ITI / NTC / NAC in related Trade. What Application Fee Have to Pay for Applying this SAC Recruitment 2018? All Indian candidates who are wishing to apply for this ISRO Recruitment process 2018 need not to pay anything. All INDIAN candidates can apply online for free for these Government Jobs in India. What is the Process for Selection for this SAC Recruitment 2018? ISRO Recruitment department decided to conduct 2-Test for the final selection of the candidates. That means there will be 2-Tier examination for this SA Recruitment. 1). First Stage: This is a written examination and known as 1-Tier of the exam, those who get selected under this tier of exam will go to 2nd Tier. 2). Second Stage: This is the Tier-2 examination or you can say a SKILL TEST for the final selection of the candidates. Applicants meet with the all criteria mentioned above in this post, have to apply online. The process for applying online is active now; you can apply through the SAC official website. We share the direct link below for online application form, Just click on the link and that link we redirect you to the online application form. All the best to all the participants. 11th May 2018 is the Last Date to Apply.